How much does it cost to travel to Tihany? How much money will you need in Tihany? Ft12,939 ($45) is the average daily price for traveling in Tihany. The average price of food for one day is Ft5,332 ($19). The average price of a hotel for a couple is Ft11,200 ($39). Additional pricing is in the table below. These average travel prices have been collected from other travelers to help you plan your own travel budget. Located on the northern coast of Lake Balaton in Hungary, Tihany is a historic village with quaint streets and bustling squares - all centered on the twin-towered Tihany Benedictine Abbey which dates back to the 11th century. The famous abbey which overlooks the Balaton's waters is a landmark of the village. It was built by King Andrew I, who was buried in the crypt in 1055. The church itself, however, was rebuilt in Baroque style in 1754, and still functions today. Having operated as Tihany's cultural center for centuries, the church is also frequently host to organ concerts during the summer season. Additionally, the viewpoint of the lake next to the church is always one of the best in the area any time of year. Outwards from the abbey, the village sprawls into busy squares and quaint residential streets. There are also plenty of restaurants and cafés with views of the lake, as well as opportunities for buying local goods and crafts. Another popular attraction is the Tihany echo - a single point where the unique landscape acoustics return the echo of your voice perfectly from the open hillside of Tihany. This spot is a site of many local legends which feed the culture of the area. Also unique to the peninsula are its large fields of lavender, which bloom with fragrance and color in the spring. Lavender House Visitor Centre offers a place where visitors can learn more about the history of the Tihnay peninsula, as well as the region's lavender-growing culture. Another very interesting spot to see in Tihany is the medieval hermitage just north of the town. These living spaces, complete with cells, dining room, and a chapel, were carved out of the rock of the hill in the 11-14th century by Greek Orthodox hermits. This site, the abbey, and the village together make the peninsula as a whole an impressive historic district. 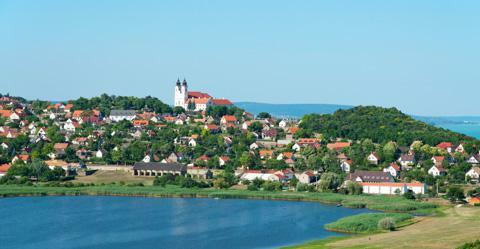 The village of Tihany is situated on a peninsula which juts out into Lake Balaton from its northern coast. Founded on the peak of a small hill, the town itself overlooks stunning views of the lake area, concentrated mainly on the eastern side of the peninsula. The area around the Abbey is made up of small streets and squares filled with traditional restaurants, courtyards with vendors selling handicrafts, confectionaries, and souvenir shops. It is a very picturesque village to explore. At the base of the hill, Tihany's harbor is also worth a visit. From here, visitors can take a ferry to the town of Szantod on the south coast. It will carry passengers, bikes, and cars. Szantod is another historic village with beautiful views of the lake. The best way to experience Tihany is to explore the village on foot, appreciating the medieval history of the abbey and surrounding area, and taking in the intricate details of the modern culture's day-to-day life and customs. Spend the day shopping for locals goods, dining by the water, or sipping regional wines, or get out on the water via boat or ferry to appreciate the beauty of Hungary's largest lake. Lake Balaton is also a prime location for activities like swimming, sailing, and kitesurfing, while some of the nearby towns also have thermal spas for relaxation and healing. Just north of the lake, the hills of the Balaton Uplands National Park are also a great place for hiking and catching sight of some of the local wildlife. Cuisine of Hungary is primarily based on meats, seasonal vegetables, fruits, fresh bread, dairy products, and cheeses. Paprika is used generously in cooking and is considered the national spice. Goulash, a soup or stew of meat and vegetables and seasoned with paprika and other spices, is especially popular and common throughout Hungary. Other specialties include stuffed peppers, cabbage rolls, roasted meats, and casseroles, as well as a hot and spicy fish soup called halaszle, a chilled sour cherry soup called hideg meggyleves, and Hungarian crepes called palacsinta which can be stuffed with jam, cheese, raisins, or meat. On the eastern side of Tihany's hill, there are many charming restaurants offering tables with panoramic views, and wineries with signature white wines from the Balaton region. Tihany is also world renowned for its lavender. Hungary's main international airports are Budapest Ferenc Liszt International Airport in Budapest (formerly Budapest Ferihegy International Airport) and Airport Debrecen in Debrecen. From Budapest, Tihany is about 140 kilometers southwest. Frequent trains connect Budapest with many locations on the shores of Lake Balaton. The village can also be reached by car via the M7 motorway, and there are bus services available as well.